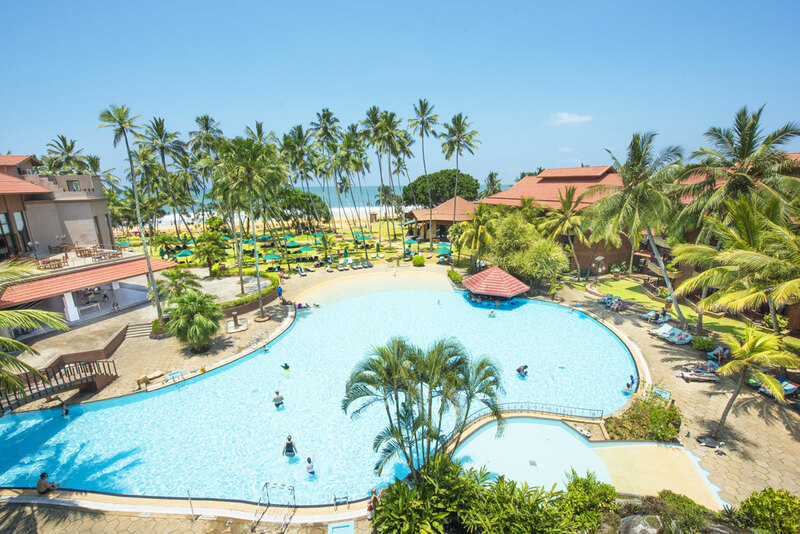 Colourful sunsets, powder-white sands, lush palm trees, and sun-filled skies await when you check into Royal Palms Beach Hotel in Kalutara. 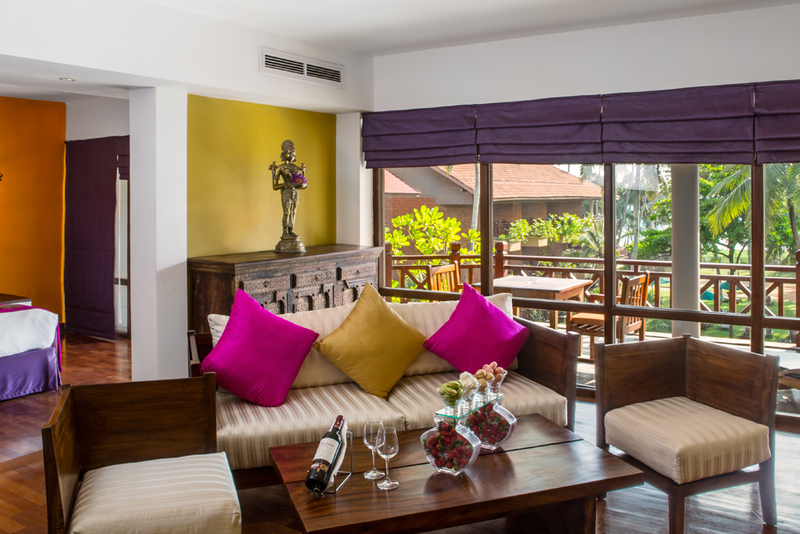 Add into the mix abundant on-site facilities, tasty local dining, and a choice of stylish and well-equipped guest accommodation and you have the perfect recipe for a relaxing Sri Lankan holiday. Spend your mornings sunbathing by the pool, taking a dip in the Jacuzzi, or relaxing in the shade with a book. Indulge in a rejuvenating facial at the on-site beauty salon or arrange a massage at the nearby spa. Partner up for a game of tennis or join in a lively game of volleyball. 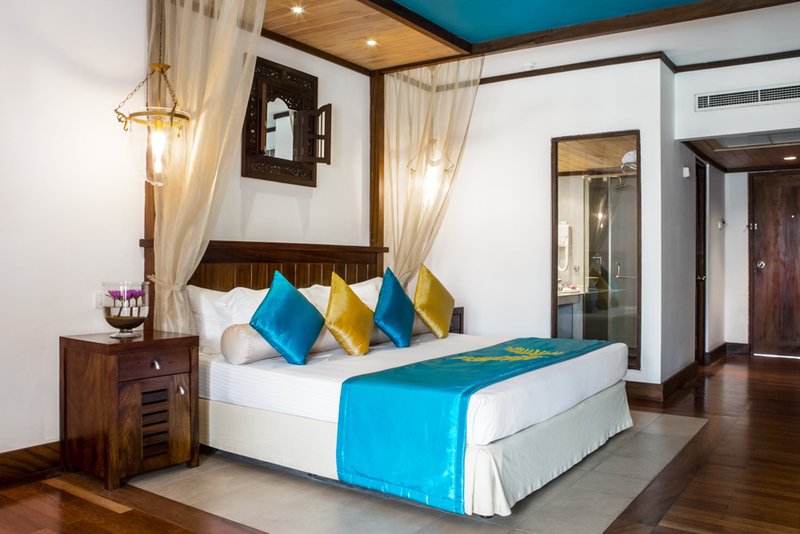 Leave the hotel behind and visit the nearby Kalutara Temple or Turtle Hatchery. Retire to your deluxe guest room or suite where welcome touches such as DVD player, satellite television, Wi-Fi Internet access, minibar, and 24-hour room service add to your comfort. The air-conditioning and comfy beds set the scene for a good night's sleep. The balcony or terrace is your window on the world and offers stunning garden or sea views. You don't have to wander too far for freshly-cooked fare; from lavish buffets and themed nights in the main restaurant to East Asian-inspired seafood dishes and Sri Lankan beach cuisine. The barmen will mix your favourite cocktails by the beach as you listen to live music or you can head to the night club to dance and have fun until late into the evening. 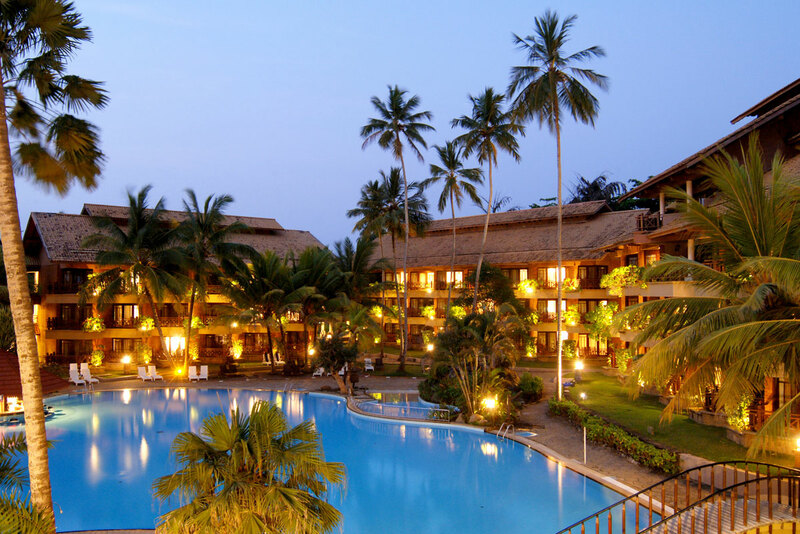 Choose Royal Palms Beach Hotel for your stay in Kalutara. Royal Palms Beach Hotel facilities include: a unique walk in swimming pool with swim-up bar, Jacuzzi and children's play area, sun terraces lined with sun beds, parasols, and shady palm trees, four restaurants/cafes, four bars, night club, library, shopping arcade, beauty salon, spa (in nearby Tangerine Beach Hotel), 24-hour reception, laundry service, currency exchange, concierge, business centre, room service, and parking. Sports-wise there is a fitness centre, table tennis, tennis court, squash court, volleyball court, billiards, and snooker. The main restaurant on the upper floor offers an open terrace, local, continental, and oriental buffets, and themed nights. 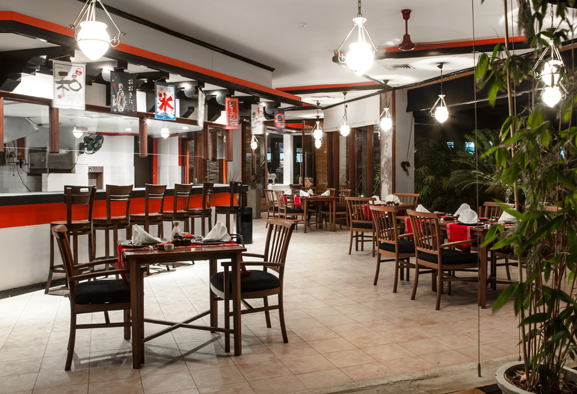 Savour a menu of delicious East Asian-inspired seafood-based dishes at Oriental Seafood Restaurant. 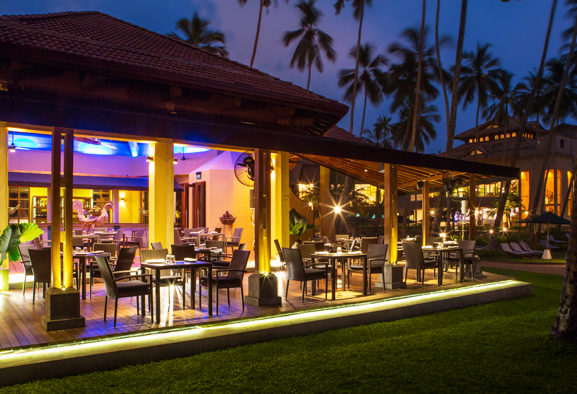 Tropics Bar & Grill is the perfect place to experience authentic Sri Lankan beach cuisine for lunch and dinner; followed by a Happy Hour and live music every evening and a choice of tropical cocktails, ice-cold beer, and chilled wines. Palmetto Coffee Shop serves light meals and snacks by day and traditional char-grilled dishes by night. Relax with sundowners and soothing live music at the Hurricane Lounge Bar or sip while you take a dip at the Swim-up Pool Bar. Cabana Beach Bar and Café will serve you snacks and drinks throughout the day and evening, and you can party the night away at Below Zero night club and Fahrenheit Bar. Keep in shape with a workout in the fully-equipped gym or a morning swim in the pool. There are billiards and other indoor games for the more laid back or you can join in with lively tennis, table tennis, volleyball, squash, and beach games. Younger guests are kept entertained at the children's play area or splashing around with Mum and Dad in the pool. Indulge in a full-body massage in the nearby Tangerine Luxury Ayurveda Spa, enjoy retail therapy at the shopping arcade, and pamper yourself with a facial at the on-site beauty salon. Visit the famous Kalutara Temple, take a trip to the colonial-style Richmond Castle, or watch the fishermen land their morning catch at the fishing harbour. If nature and conservation interest you, the nearby Turtle Hatchery is a must, while Bawa Botanical Garden is a delight for gardeners. 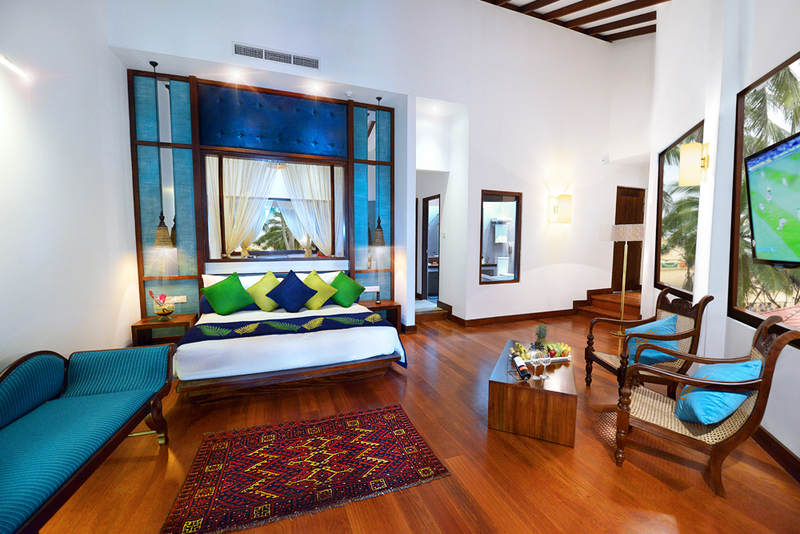 There are a total of 136 guest rooms and suites at Royal Palms Beach Hotel, comprising Deluxe Rooms, Studio, Heritage, Royal, Executive, Penthouse, and Rajasthan Royal Suites. Deluxe Rooms come with a king-size bed, bathroom with walk-in shower cubicle, ironing board, DVD player, air-conditioning, IDD telephone, satellite television, bathroom, hairdryer, Wi-Fi Internet access, minibar, 24-hour room service, and safe.